Click the flyer below to view our current specials on automotive supplies. Use the Contact form to the right to send questions by email, or call us at 717.762.1532, & ask for Annette. Click image above to view sales flyer for a quick look at our Spring specials! 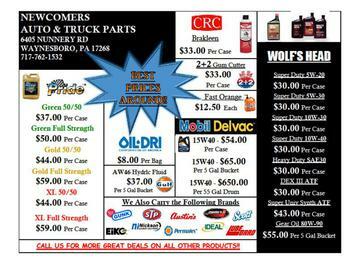 Automotive supplies, oils, antifreeze, solvents in Waynesboro, PA, Franklin County. Serving Franklin County PA, Waynesboro, Greencastle, Chambersburg, Gettysburg, Hanover, and York, Pennsylvania and beyond. Serving Hagerstown, MD, Frederick, Walkersville, Taneytown, Westminster, Martinsburg, Berkley Springs, Washington County, Maryland, and beyond. Flyer will open as a PDF (Adobe Reader required). To download Adobe Reader software, click here, then click the ADOBE READER icon.